Making cold process soap is super duper easy. You just cut the soap base into small squares and microwave it in 30-second increments. Stir well between increments. Then all you have to do is add the stuff you’d like in the soap. Luffa soap (or loofah, it’s all the right way to spell it) is bar soap with the exfoliating power of luffa sponge right inside. Did you know you can even grow the luffas yourself at home? You can get luffa seeds here. And luffas here. Any post on this blog may contain affiliate links which pay me a very small commission for items you purchase using the links but costs you nothing extra. 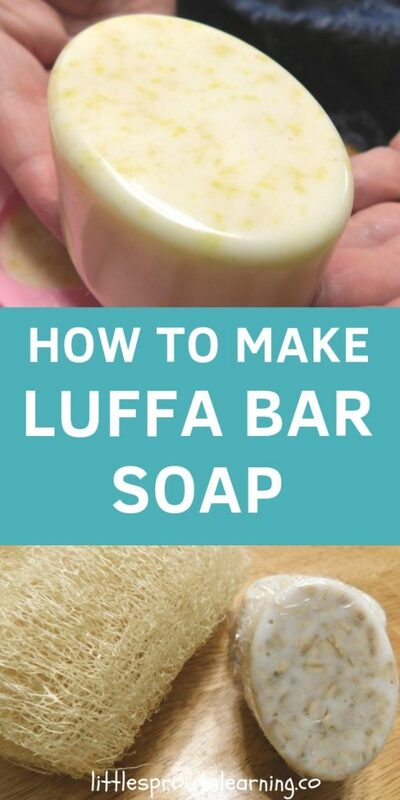 You can use the luffas in slices for a gorgeous bar of textured soap, or you can even grate the sponges up and distribute them into your soap that way. How do you grate luffas? How do you grate luffas? Just take a small slice of luffa and put it in your blender or food processor. Be careful because the fibers can get stuck on the blades, so use caution when removing them and always unplug the machine before you attempt it. If you have trouble grating it, add a few drops of water and try again. Just make sure to let it completely dry out again before using in your soap. 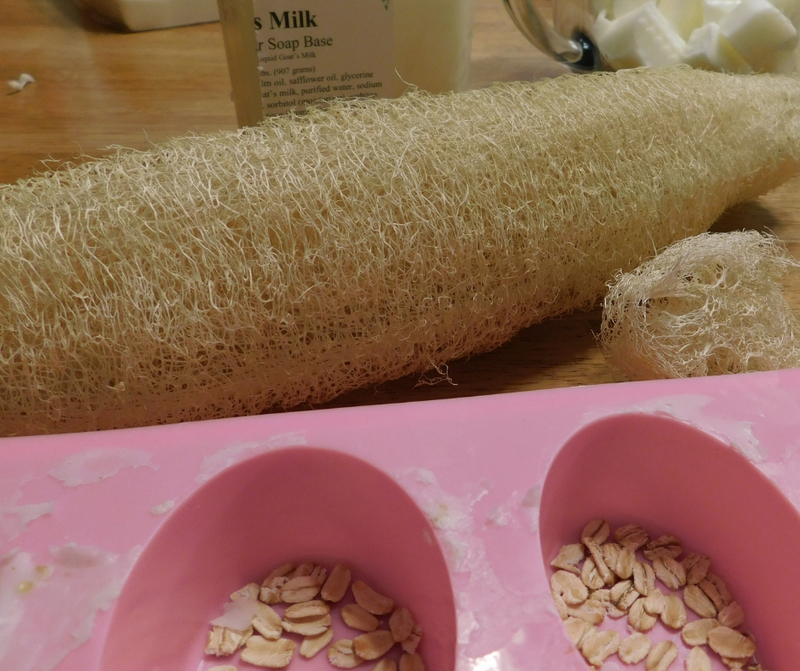 There are so many uses for luffa sponges, what is a luffa anyway? Click on the highlighted links to learn more. Luffa body soap scrub is a great way to keep your skin super smooth and free of dead skin that builds up on the surface. Just massage skin in a circular motion with your loofah bar and work it into the skin for several rotations until you move to the next area of skin. When you rinse the soap off, your will feel super clean and smooth as all the dead skin washes away. 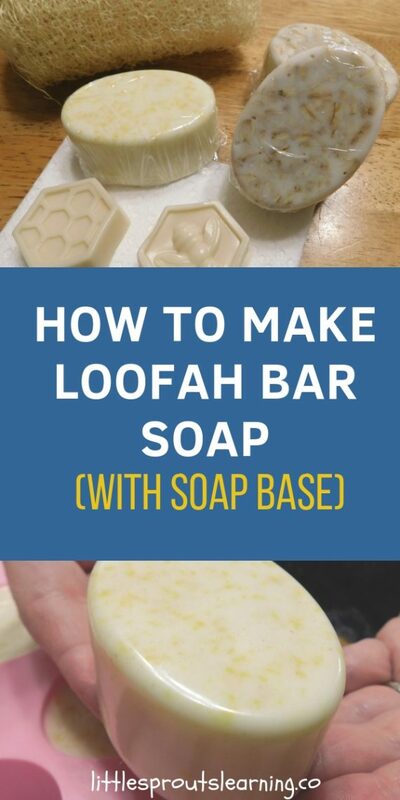 The first step to making luffa bar soap is to cut up soap base and heat it until it’s liquid. 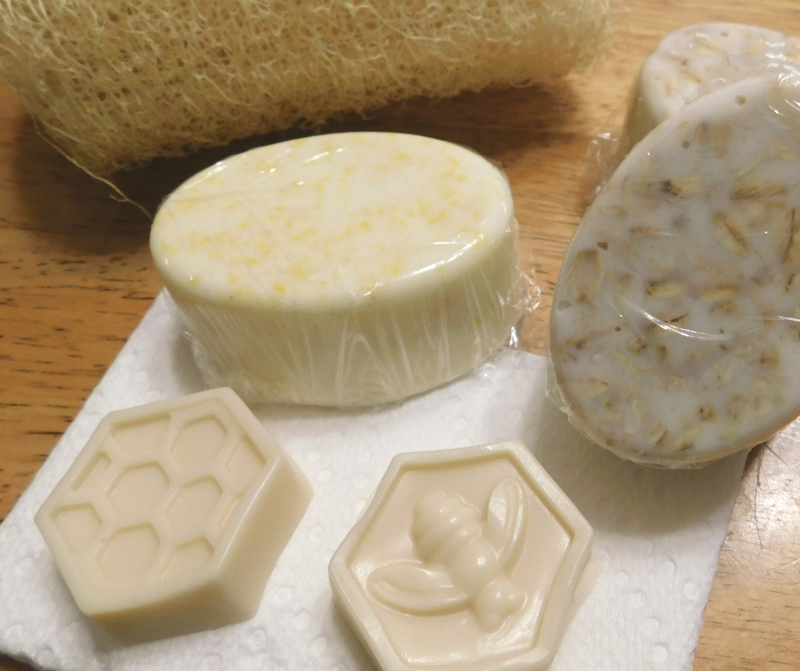 My friend Yavonna taught me how to make the soaps. 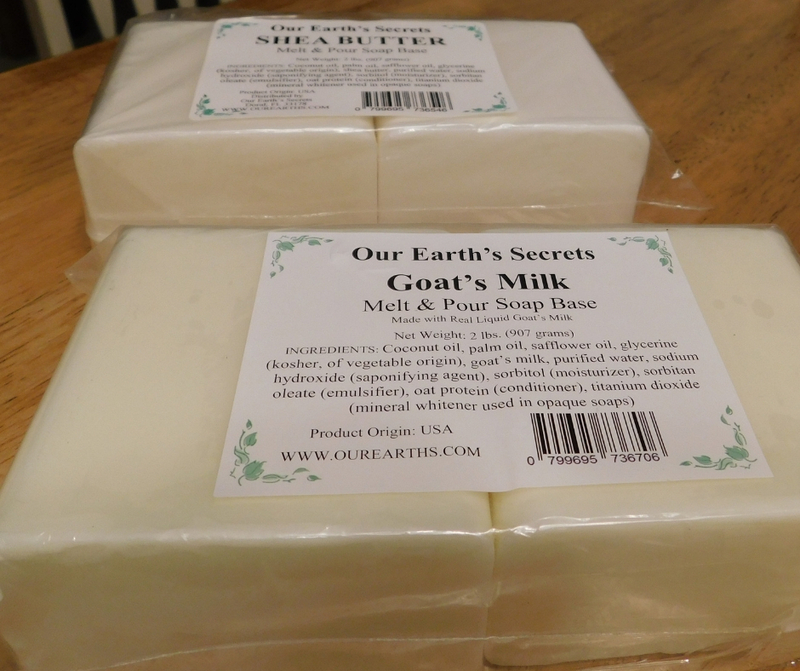 We made our soaps with all-natural shea butter and goat’s milk soap base. I have super sensitive skin and it had minimal ingredients that weren’t harsh. Next, we added our additives. 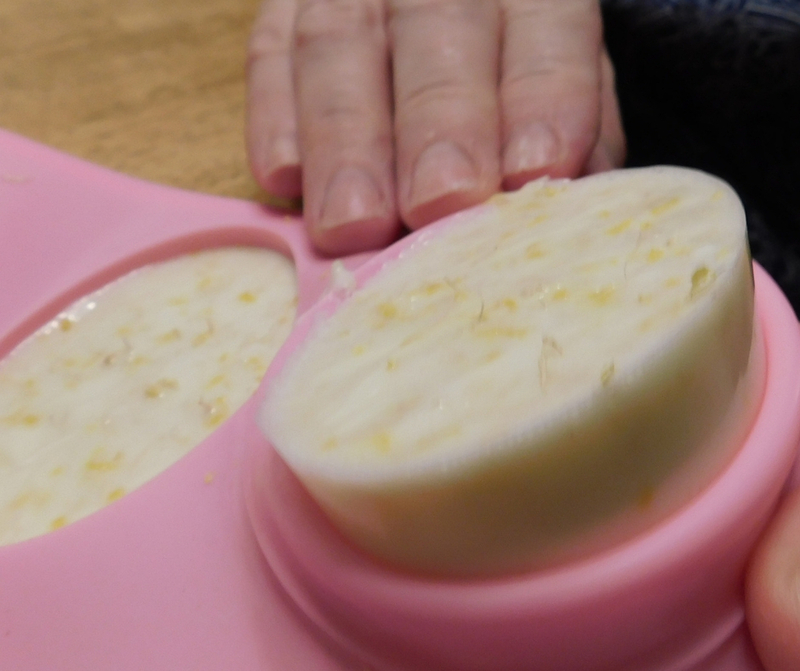 For one soap we used lemon zest, lemon essential oil, and grated luffas. 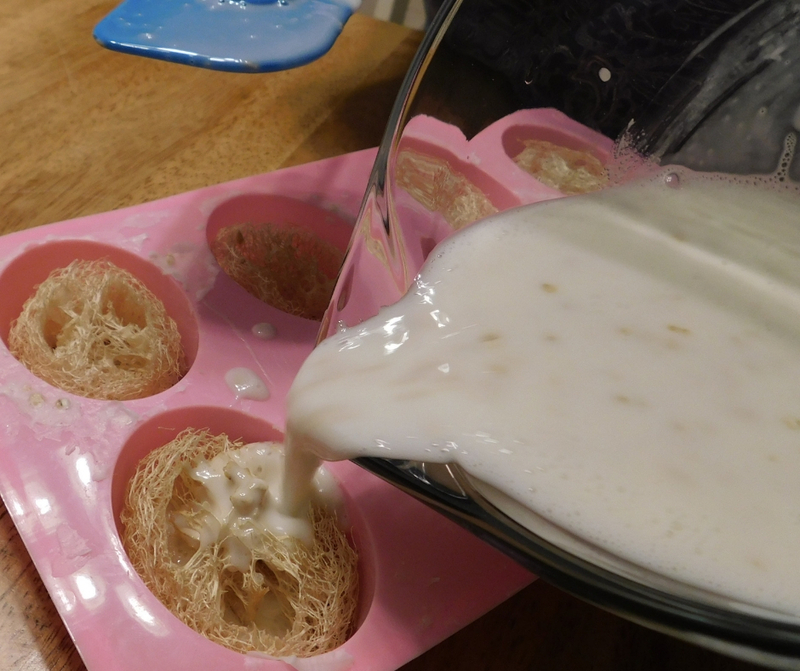 For the other soap we used oatmeal and slices of loofah sponge. 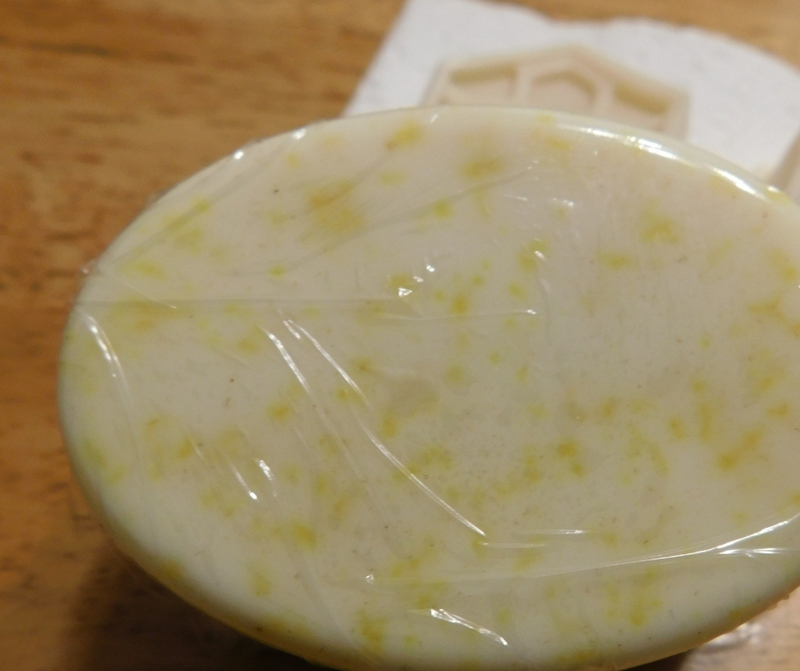 We also made a smaller decorative soap with honey and almond oil. We added peppermint essential oil to that one. Once you have the ingredients thoroughly mixed, carefully pour it into molds and allow to set, undisturbed until it is set. Then you just pop it out of the molds and wrap it however you like. We used saran wrap. You can shrink wrap it or use cello bags and tie it at the top. Just be sure it’s airtight and you keep it in a cool, dark place until you’re ready to use it or give it as a gift. 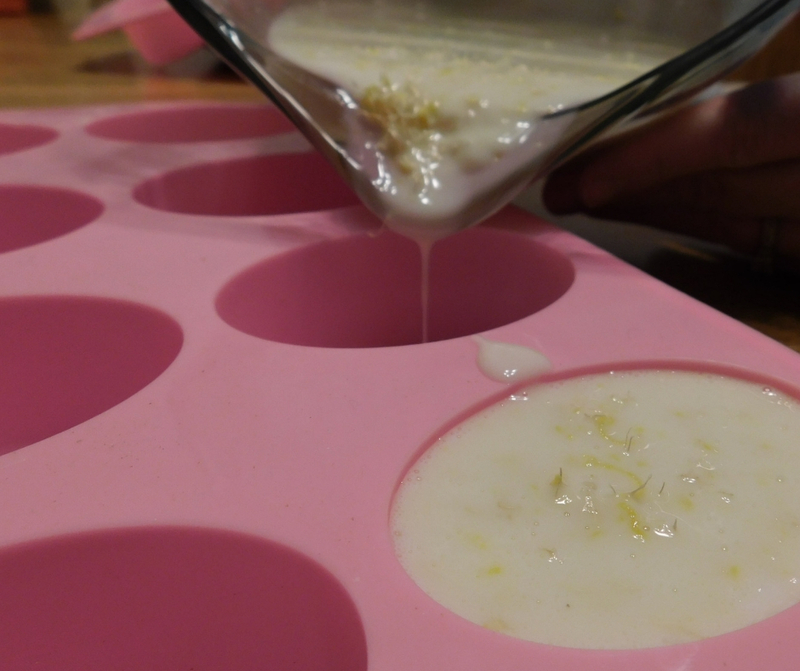 Making cold process soap is super simple and it makes beautiful, healthful and thoughtful gifts for the people you love. You can even grow some of the ingredients it takes to make it. Cut soap base in to cubes and microwave for 30 seconds then stir well. Repeat until soap is liquid. Stir in 1/3 cup quick oats. Place slice of luffa in each mold. 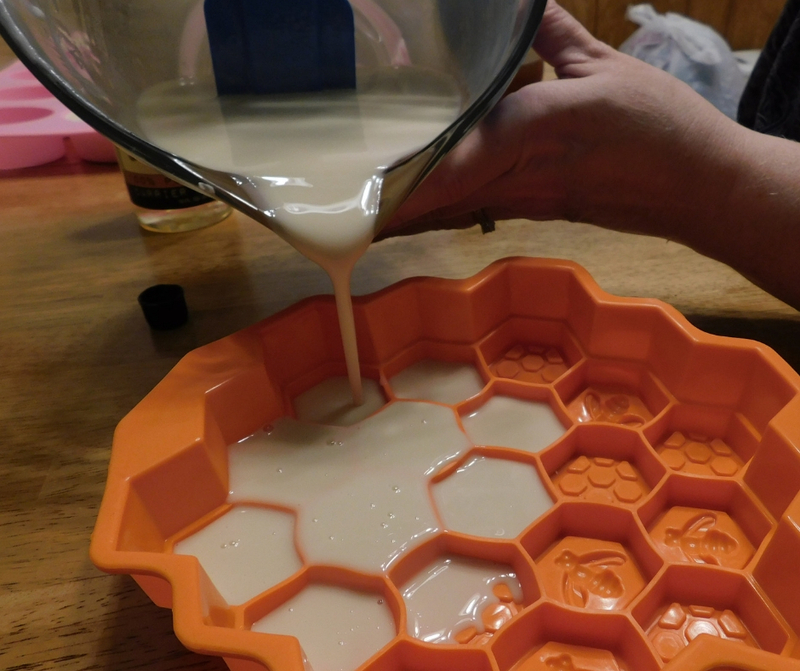 Pour soap to fill mold to the top. Pop out of molds and wrap in air tight packaging. 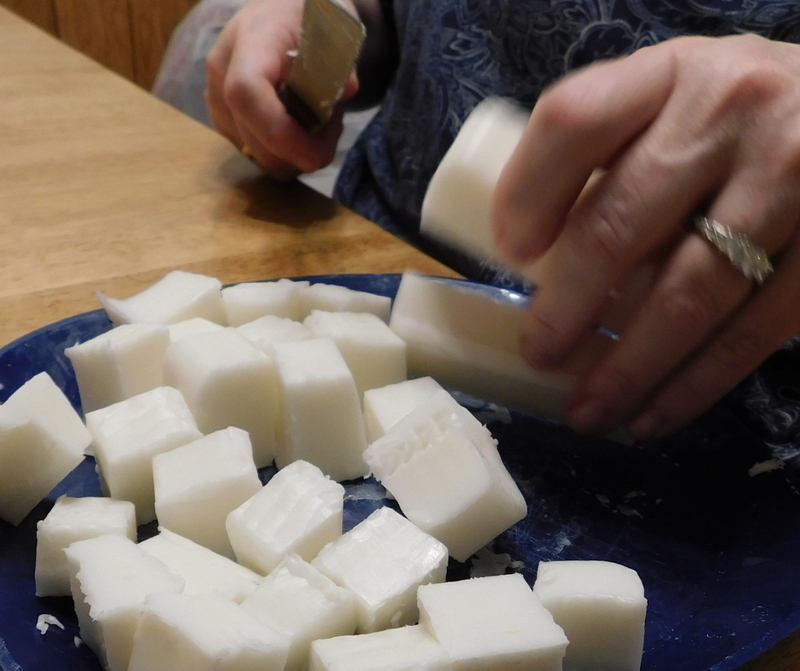 Cut soap base into cubes and microwave for 30 seconds then stir well. Add zest and essential oil and stir well. Pop out of molds and wrap in airtight packaging. Stir in remaining ingredients and stir well. 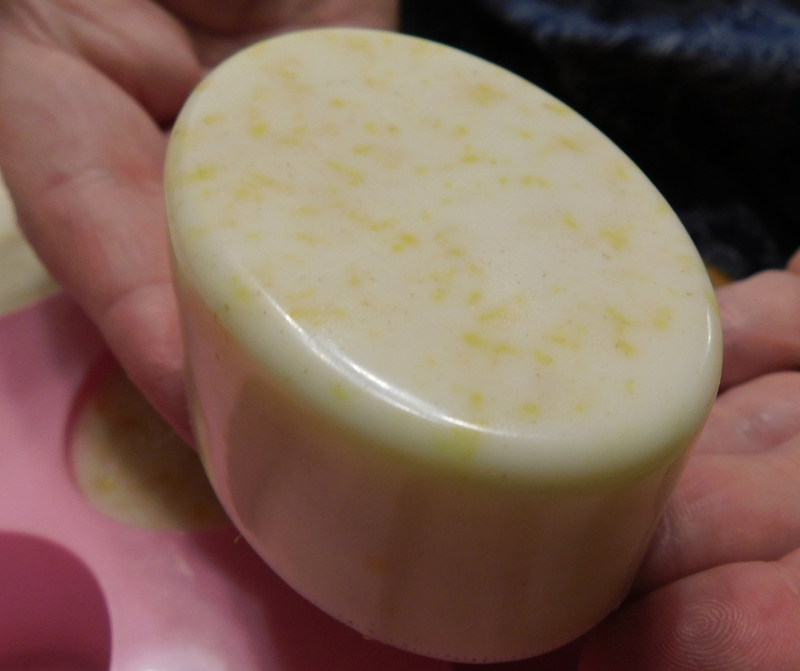 For more information on using soap base, check this out. Check out even more thoughtful homemade gifts and gifts from the garden. 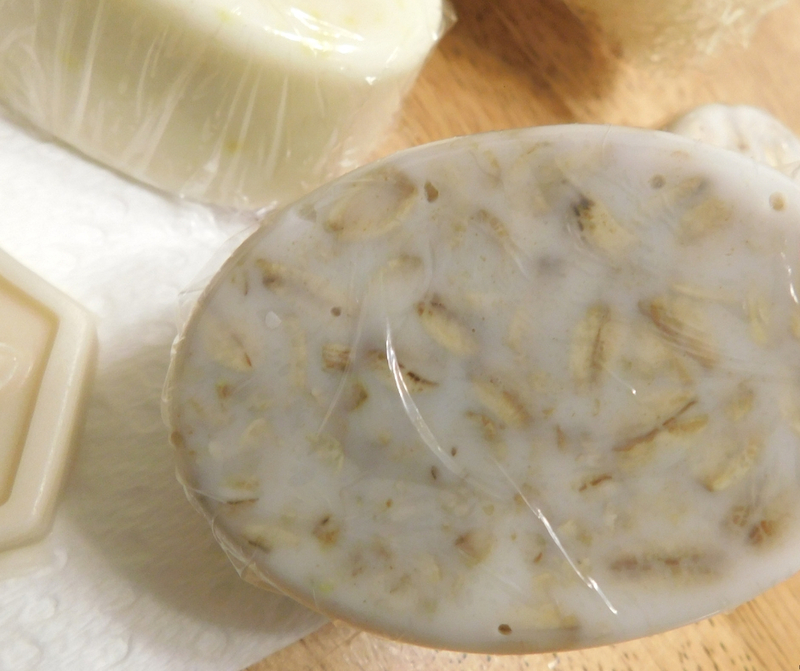 Have you ever tried donkey milk soap base? I read somewhere that it lathers better and was more moisturizing. Just wanted your opinion. I haven’t tried it or even heard of it. Sounds interesting. What do you wrap it in? You can use shrink wraps or saran wrap or any type of air tight wrap. I used the packing plastic wrap and then put mine in mason jars. I do too and I can hardly find any soap I can use. I hope this helps you! Thank you for checking it out and helping me with it.